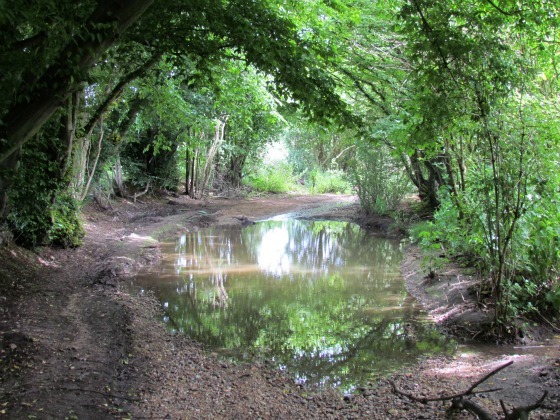 This undulating walk along footpaths, byways and quiet lanes taking in woodland, rivers, and open spaces involves a lot of up and down with a total elevation gain of almost 400ft. There are refreshment opportunities both on and slightly off the route at Little Berkhamsted, Essendon and West End. Park in the lane outside the Candlestick pub at West End. Facing the pub, take the footpath (Essendon Footpath 13) to the left of the building which heads south-east and leads to a stile. Cross the stile and walk downhill, keeping the hedge on your left and the field on your right until the path goes through the woods and reaches the byway open to all traffic (BOAT). 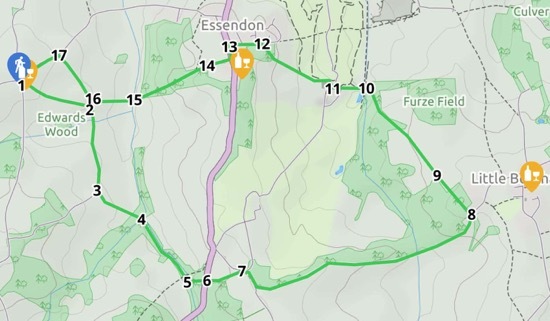 Turn right at this point and head south following this byway (Essendon BOAT 14) downhill and then uphill until you reach the top of a hill where you will see a sign on the left with a yellow arrow pointing to a footpath and a gate. Go through this gate and continue heading south-east following the footpath (Essendon Footpath 16) as it leads to an open field. Continue with the hedge on your left and the open field on your right. In autumn and winter you can see Camfield Place, the estate of the late Barbara Cartland, through the trees. The path eventually leads down to a footbridge over the river. If you are lucky, you might see a heron at this point. Cross the bridge and continue straight ahead heading east through the woods. Keeping the stream on your left, continue straight along an old byway. As you continue the stream on your left cuts through sand banks. Look out for flashes of blue at this point, because this is kingfisher country. As the path climbs through the woods you will eventually reach a point where two footpaths cross. To your left, the path drops down to a footbridge across the river, don't take this path. Your way is straight ahead as the path continues to climb slightly, and then drop down to another footbridge across the river. Cross the small footbridge and climb some wooden stairs cut into the bank until you reach some more steps leading to the B158. Your next path is directly opposite. Take care crossing the B158, because it can be busy at times. Enter the footpath on the opposite side (still Essendon Footpath 16), signposted Berkhamsted Lane ¾ miles. Continue heading east along this fenced path with a field on your right and a hedge on your left. Take care through a patch of nettles. The path veers right until you reach a bungalow on your right and the path opens into Cucumber Lane. Cross Cucumber Lane and head north-east down Berkhamsted Lane opposite. Unfortunately, this part of the walk requires almost a mile of lane walking, however the lane is pleasant and we met one car and two horses only. When you reach the outskirts of Little Berkhamsted you come to a 30 mph sign and a welcome sign. Soon after, you will see a footpath sign to the left by two white gates and a lodge. (At this point you could make a short diversion into the village of Little Berkhamsted village where there is a pub, The Five Horseshoes, and shop). 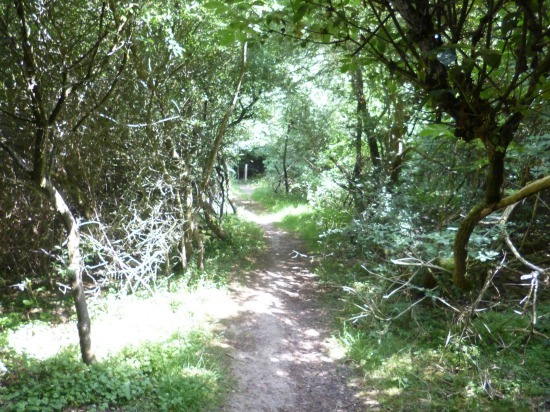 If you don't need a break, turn left here and follow the track until you reach a sandy, gorse-lined bridleway (Little Berkhamsted Bridleway 17). Continue straight along a ridge-route path with excellent views to all sides. This sandy path continues north, dropping down eventually through woodland to a small cottage on the edge of the golf club. Pass the cottage, keeping the cottage to your left, and follow the yellow arrowed sign posts up the track (Essendon Bridleway 4) through the golf club. The path leads to a wooden-faced building. At this point turn right, keeping the wooden building on your left and a series of water features on your right. Continue round the building following the yellow arrows. The path climbs uphill and crosses a fairway. Watch out for golfers teeing off to your left. Cross the fairway and, at a point where a golf club path turns right, continue straight ahead, leaving the golf course and walking past a white gate and into the woods. This footpath eventually leads to School Lane, Essendon. Turn left on School Lane and then turn left again at the junction with the B158. Walk on the right hand (west) side of the B158 for a few yards until you come to a footpath sign and a gate. (If thirsty, you can keep going straight on here to a pub, The Rose and Crown, on the left). Go through the gate and you will now be in the grounds of Essendon Cricket Club. Keep walking straight along this footpath (Essendon Footpath 13), with the cricket pitch on your right and the wall on your left, until you reach the club house. Keep to the left of the club house and go through a gate. The path now drops downhill with a hedge on your left and a field on your right. After a few yards you will see a sign and gate on the right, ignore these and all other paths off as your way is straight and downhill through the woodland. Near the bottom of the hill this path becomes fairly steep and care is needed as it weaves down in a zig-zag until it reaches the valley bottom and a small wooden footbridge crossing the stream. Cross the bridge and keep going straight through another gate and then straight on up the hill with fields on either side. You will soon come to the byway open to all traffic which you walked earlier (Essendon BOAT 14). Turn right and head north-west to West End Lane. Turn left on West End Lane and head south-west back to your starting point at the Candlestick pub.